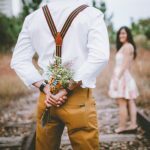 Miss Travel Dating Site Review - Is this site worth it? 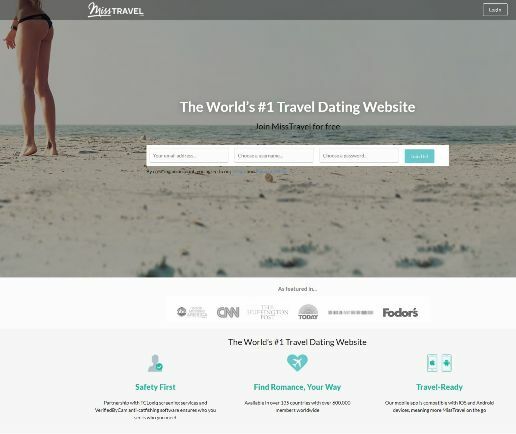 Miss Travel Review – Is this dating site worth it? Like to travel? Want to meet other singles with similar interests that want to see the world with you? 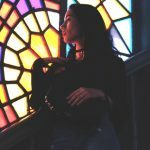 Miss Travel is a brand new online dating concept that looks to connect you with other singles looking to travel the country and the world. During our review of Miss Travel, we found a lot of interesting things that you should be aware of before you consider joining the site. If you’ve got a wild streak and are looking to try something new, read through our review to see if Miss Travel is for you. 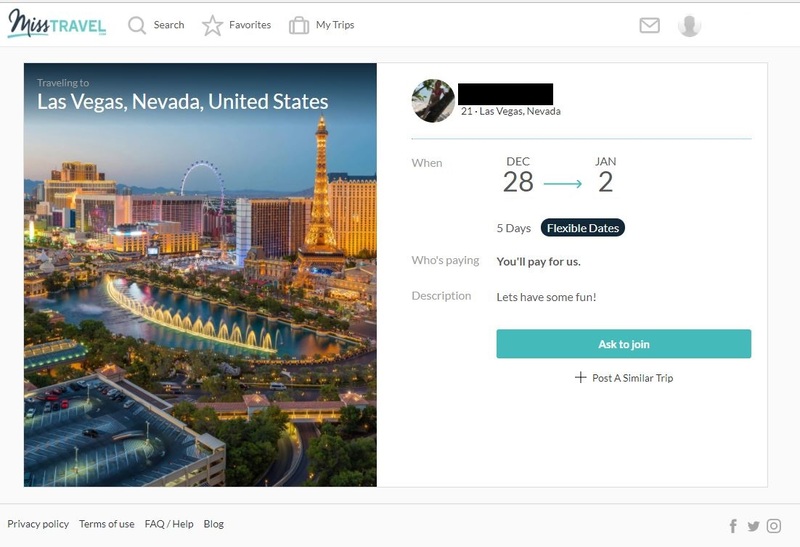 The site gives you the option to suggest trips you want to go on, list trips you are going on, or search for trips that other members are interested in or already scheduled to go on. You then have the option of having another member pay for your trip, pay for another member’s trip with you, or decide to split the costs. Keep reading as we break Miss Travel down for you piece by piece. One of our favorite things we saw during our Miss Travel review was how quickly they let you get signed up. It took us less than five minutes to get to looking through trips and uploading our own ideas. Miss Travel asks you for some basic information and then gets you straight into the mix in no time. Here’s a look at what is required of you when you are signing up. When we started reviewing Miss Travel, we really weren’t sure what to expect regarding members, the volume of members, and quality of members. With a new site, you can end up with an awesome selection or a complete dud of a dating site. Here’s what we found. There were A LOT of quality and attractive looking members of both sexes. 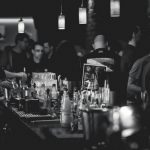 What you might also expect, is that everyone on the site is looking to get their trips paid for and nobody wants to shell out any money. To be honest, this is what we expected. What we found was surprising. For female members, the biggest majority were looking for their trip to be paid for. However, there were a lot of women who were looking to go on a trip and split the costs 50/50. We found very few women that were advertising that they wanted to front all of the costs, but there were a few. For the men, the bigger majority that we saw in our review searches were looking to pay for the whole trip. This means if you’re a lady looking to go on a free trip with someone exciting, you’re going to be pretty happy with Miss Travel. Great for men who are looking to pay for trips or split the cost of trips. Not the best if you want someone to pay for your trip. Great for women who are looking to have their trip paid for, split the cost, or pay for a trip. Overall, our review of Miss Travel showed that the site is well designed and is great in the user-friendliness department. The member dashboard area is simple, easy to use and not overloaded with unnecessary features that just make the programmers feel happy. 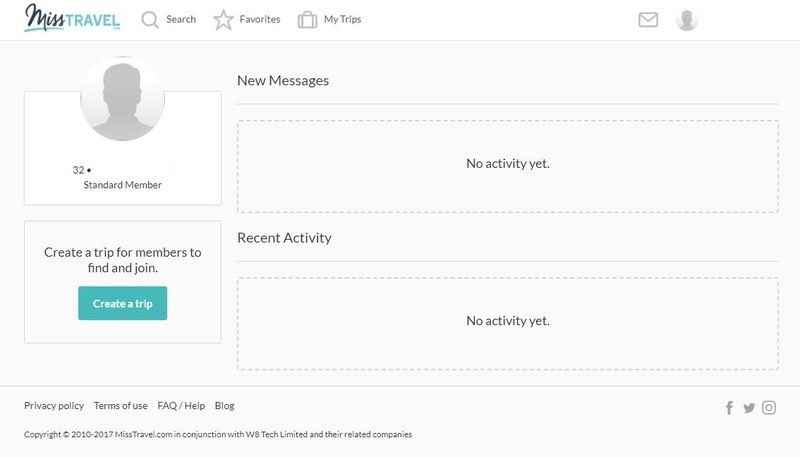 Here’s what your member dashboard on Miss Travel will look like. Yes, ours looks a little bare, but that’s because we don’t like to interact with members during our reviews. We feel that’s not fair to the members and we don’t want to get anyone’s hopes up 🙂 Across the top of the dashboard, you have the option to search, look at your favorites, or see the status of the trips that you are interested in taking. Along the central area of the home page, you’ll see any new messages, likes, or other activity that you might be getting from other members. The profiles on Miss Travel are well laid out and easy to navigate. We’ve included a quick screenshot below for you to take a sneak peek at. When you utilize your free trial account, nothing will be blurred out. We only did that in case the member we were looking at didn’t want to be a part of our review. Grab a chair because there is quite a bit we want to talk about here. Not because there are a ton of features but because you may not understand how Miss Travel works. We’re going to walk you through creating your own trip or searching for someone else’s trip. We’ll also talk about how everything works when you and another single decide on a trip that you’re interested in taking. 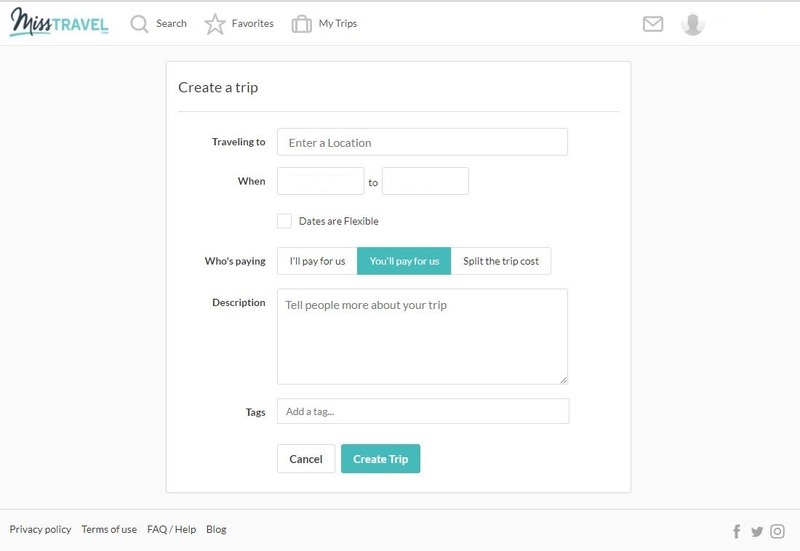 If you’ve got an idea for a trip that you want to take or already have a trip planned that you want some company on, Miss Travel makes this easy for you to get posted. 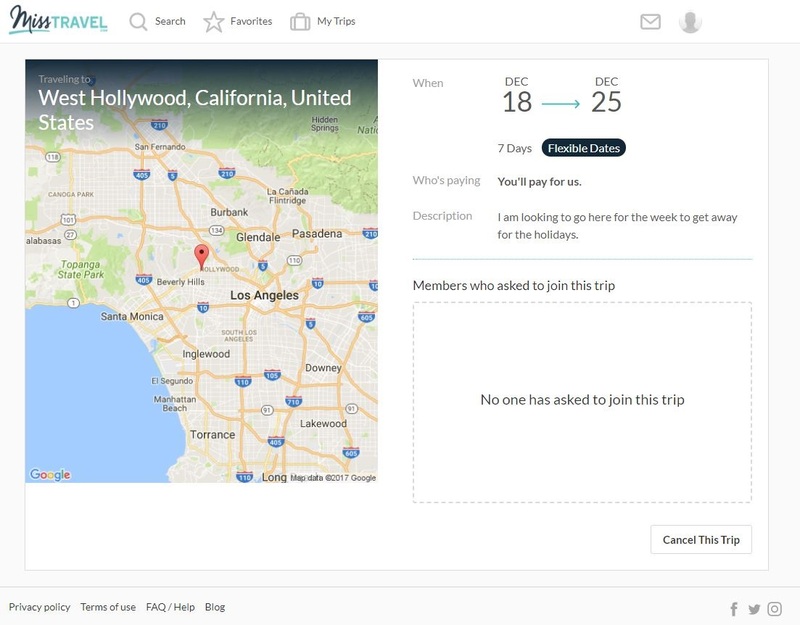 Once the trip is posted, other members are able to message you a request to potentially join you on your trip. Here is what the form looks like to post a potential trip you want to take or are taking. Here is what your trip might look like after you get it created. As you’ll notice, it’s not an overly-exhaustive procedure to get a trip scheduled on Miss Travel. You put in where you want to go, when you want to go, what your desired pay structure is (you pay, they pay, or you split it), and then you put in a description of the trip. This is a great space to talk about the exciting things that you might want to do. 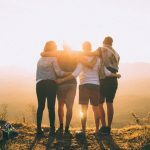 Let’s say that you’re more interested in checking out some of the other trips members are planning that you might want to join on. 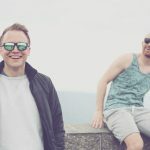 Our review of Miss Travel shows that they have a great search function with a lot of choices to help you find the perfect person and trip for you. Here is what a trip will look like when you see it from the search function. In addition to searching for trips specifically, you can also search for members and interact in a more traditional online dating sense. As with the trip search, you also have a lot of options. 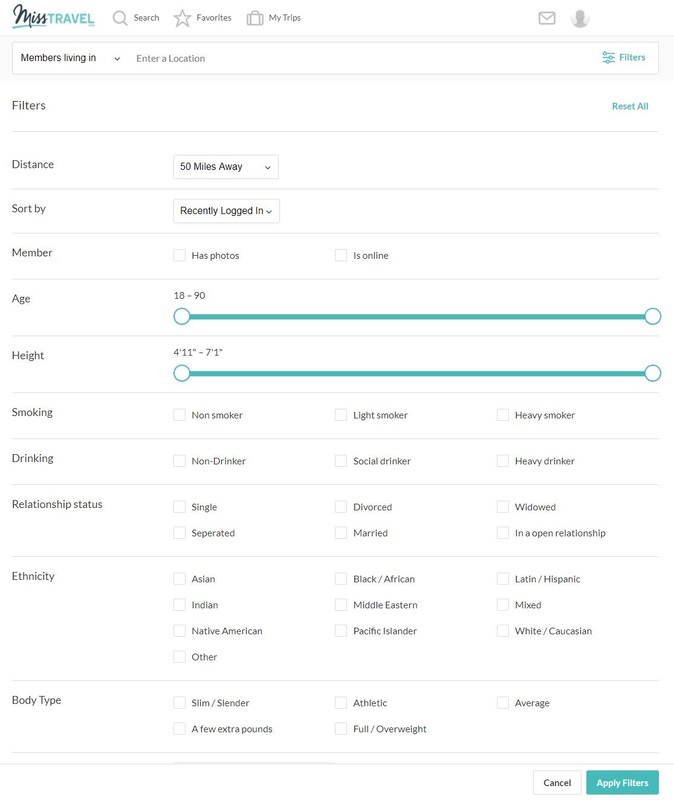 Here’s what the member search options look like. What Happens When You Want to Go On a Trip on Miss Travel? This is the biggest question that we get from people who are interested in checking out this dating site. What happens when you and another single decide on a trip? Well, none of the travel arrangements are made through the site. All of your travel arrangements and accommodations are made off of the site between you and the person you are traveling with. We believe in the past the site did do some of this, but they have decided that it’s best if everyone handles their travel plans together offline. This means that it’s going to be up to you to make sure that you are protected and that you aren’t taking any unnecessary risks. Our recommendation is to start by reading our online dating safety guide. A lot of the information in there will be useful, but there are some particular things you’ll need to keep in mind with a niche site like this. If you’re traveling internationally, make sure you know where the nearest embassy is. This will help if you have any issues overseas. Second, make sure that you let someone know where you are going. 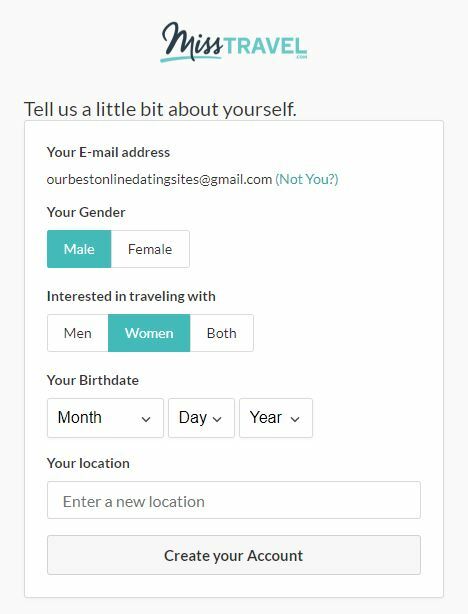 We have our online dating safety check in, but you need to put that on steroids if you choose to use Miss Travel. Make sure that someone always knows where you are, who you are with, where you are going, and when you will be back. You should also periodically check in with them just to make sure they know you are okay. We aren’t trying to scare you away from this site. It’s just something new that you might not be used to and we want to make sure that you are safe and protected. That way, you can have the absolute most fun possible traveling with new singles and hopefully finding something special. Miss Travel has a well laid out FAQ section with information on memberships, using the site, traveling, and additional concerns or questions you might have about using the site. The dating site also has a support ticket function for you to use if you need personal help with something. The help tab is on the footer of the website and the forms can be accessed through the links on the bottom right of the Help page. You can also reach out to customer support from their Contact Us page via email. In case you need it now, it’s support@misstravel.com. Overall, we were pleased with the different customer support options at Miss Travel. We’d love to see them eventually add some form of live chat or phone support, but it’s not a deal breaker for us. Below, you’ll find an updated cost sheet for Miss Travel. Our team regularly updates these numbers in the instance that any pricing changes. If you’d like a complete breakdown of the costs associated with Miss Travel, what you’ll get with your membership, and all of your options, check out our Miss Travel cost page now. Is Miss Travel worth it? 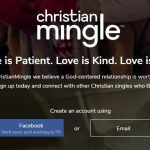 So, is this dating site worth your time, money, and your effort? Honestly, we think that if you’re a single who likes to travel and wants to meet potential mates in a new and exciting way, you’re going to love this site. 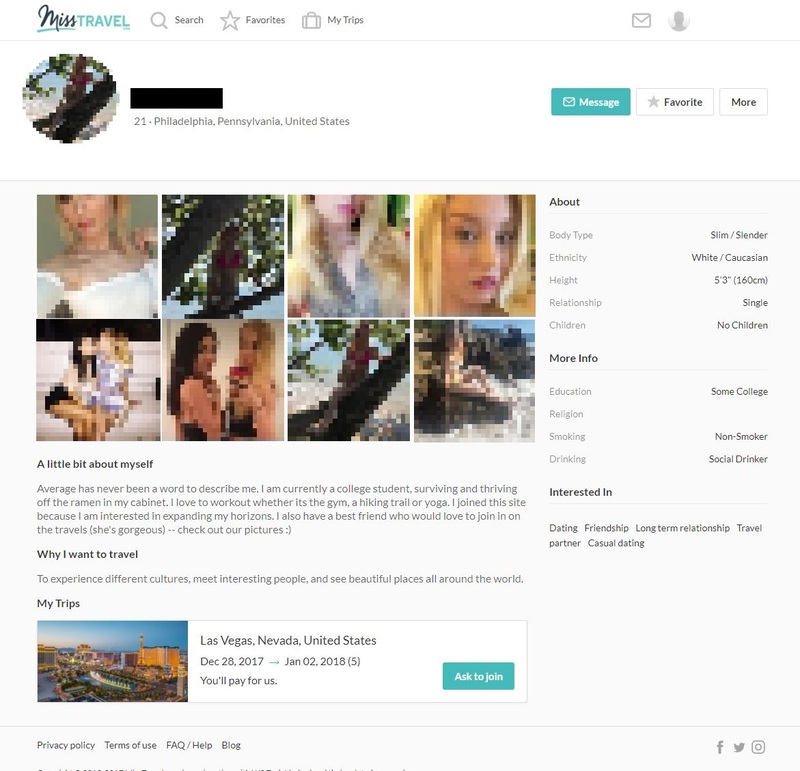 If you’re looking to have someone else pay for your trip somewhere, you’re going to have a lot more luck if you’re a female. If you’re looking to split the costs, there are great options with high-quality members for both men and for women. At the price listed, we think the site is worth it. Even if you don’t end up going on any trips, you can still meet some pretty awesome people and might find a spark. With the free trial link below, you’ll be able to see everything and everyone. You’ll be able to search through the site and see if there is anyone that strikes your fancy. You’ll be able to see everything before you make a decision on whether or not you want to upgrade to a paid account. If you’re looking to take a chance on finding love and you love to travel, give Miss Travel a try today!